In one clip, a French policeman appears to blast a wheelchair-bound man in the face with pepper spray. In another video, reportedly captured with a mobile phone camera, a concussion can be heard - after which the camera shows a man on the ground who had been shot in the face as first responders rush to assist him. French police have been firing 'non-lethal' 40mm rubber projectiles, which are supposed to be less harmful than rubber bullets. It is unclear what the man was hit with, or whether his injuries were life-threatening. 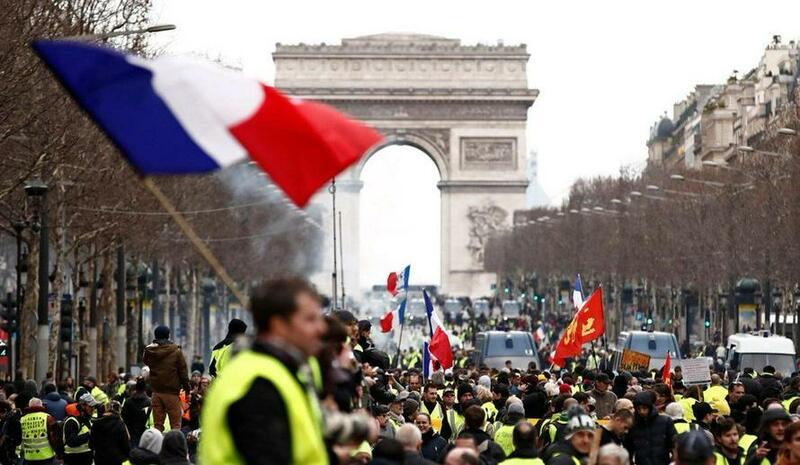 Approximately 39,000 Yellow Vest protesters turned out across France over the weekend, including 4,000 in Paris according to official government figures - down from the 46,600 reported last week. "we keep protesting every Saturday because Macron doesn’t respond at all to the yellow vests’ demands. We want to rebuild our democracy and change today’s political system," said Paris yellow vest coordinator Sophie Tissier. "Macron is contemptuous and … does not even try to understand that there are people that are living in great poverty and precariousness, and that there are so many inequalities," she added. The protests initially began in November in opposition to a gas tax linked to climate change, and quickly evolved into a general anti-government movement.